An unaltered photocopy of your WD AGO 53-55 or other military issued document clearly displaying your award of the Asiatic Pacific Campaign. The Asiatic-Pacific Campaign Medal was established by Executive Order 9265 signed by President Franklin D. Roosevelt on November 6, 1942, and implemented by War Department Bulletin 56 (1942) and Navy Department General Orders Number 253 (1942). The Asiatic-Pacific Campaign Medal was awarded for qualifying service between December 7, 1941, and March 2, 1946. -- For service in active combat in the Asiatic-Pacific Theater of Operations against the enemy and awarded a combat decoration or furnished a recognition by the commanding general of a corps, higher unit, or independent force that the individual actually participated in combat. The Asiatic-Pacific Campaign Medal was worn after the American Campaign Medal and before the European-African-Middle Eastern Campaign Medal. Bronze service stars were awarded by all services for participation in designated campaigns. A bronze arrowhead device was awarded for participation in designated Army amphibious and airborne combat assaults (Note: only one bronze arrowhead could be worn on the ribbon). The obverse of the Asiatic-Pacific Campaign Medal was designed by Thomas Hudson Jones (1892-1969). The reverse was designed by Adolph A. Weinman (1870-1952). The first recipient of the Asiatic-Pacific Campaign Medal was General Douglas MacArthur, who was presented his medal on December 17, 1947. In the center of a bronze medallion one and a quarter inches in diameter, the medal depicts a tropical landing scene with a battleship, aircraft carrier, submarine and aircraft in the background with landing troops and palm trees in the foreground. Above this scene, and following the contour of the medal, are the words ASIATIC-PACIFIC CAMPAIGN. The invasion scene represents the numerous island operations of the war in the Pacific. The figures represent the Army (soldiers) and Marine Corps (Marines) while the ships in the background represent the Navy and the aircraft represent the Army Air Corps. In the center of a bronze medallion one and a quarter inches in diameter, an American bald eagle is shown perched on a rock. To the eagle's left, the dates 1941-1945 (in two lines); to the eagle's right, the words UNITED STATES OF AMERICA (in three lines). The bald eagle is the national symbol and thereby represents the American people. It is perched on a solid rock which represents the firmness of resolve and strength of America in prosecuting the war, as indicated by the dates. The ribbon to the Asiatic-Pacific Campaign medal consists of a yellow background bisected by blue, white and red pinstripes. Inside the outer edges of the ribbon there is another set of somewhat wider pinstripes, these being white, red, and white. The Secretary of War directed that ribbons for the area campaign medals were to employ Separate colors to denote the theaters they represented. The theater color was to predominate in each ribbon and the common relationship among all of them was to be achieved by using colored stripes put in the same place on each of the ribbons. The predominant yellow in the background represents the sands of the islands in the Pacific, where many of the major engagements were fought; the blue, white and red pinstripes in the center are taken from the American Defense Service Medal and represent the national colors. The white-red-white stripes inside each edge of the ribbon are the colors of the empire of Japan and represent the enemy in the Pacific during the Second World War. The Asiatic-Pacific Campaign Medal was authorized Nov. 6, 1942, by Executive Order No. 9265 signed by President Franklin D. Roosevelt. The medal was issued to commemorate the service performed by personnel of the Navy, Marine Corps and Coast Guard who served during the periods and in the areas designated below. Effective March 15, 1946, members serving in the geographical area between Dec. 7, 1941, and March 2, 1946 (dates inclusive) are authorized award of the medal. The geographical definitions of the Asiatic-Pacific Campaign Area is: East boundary -- From the North Pole, south along the 141st meridian west longitude to the east boundary of Alaska, thence south and southeast along the Alaskan boundary to the Pacific Ocean. thence south along the 130th meridian to its intersection with the 30th parallel north latitude, thence southeast to the intersection of the equator and the 100th meridian west longitude, thence south along the 100th meridian west longitude to the South Pole.West boundary -- From the North Pole, south along the 60th meridian east longitude to its intersection with the eastern border of Iran, thence south along that border to the Gulf of Oman and the intersection of the 60th meridian east longitude, thence south along the 60th meridian east longitude to the South Pole. A Bronze Service Star denotes subsequent awards for periods of service or campaigns in the Korean theater of operations. A Silver Service Star is worn in lieu of 5 Bronze Service Stars. (Army/Air Force) Bronze Arrowhead device denotes participation in parachute, glider or amphibious landing or assault. 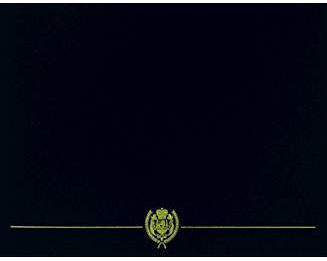 (Navy) Marine Corps Device denotes combat service with Marine Corps units. The Asiatic-Pacific Campaign Medal was designed by the Army's Institute of Heraldry. The medal is a circular bronze disc showing troop landing in a tropical setting with a palm tree. battleship, aircraft carrier and submarine in the background. 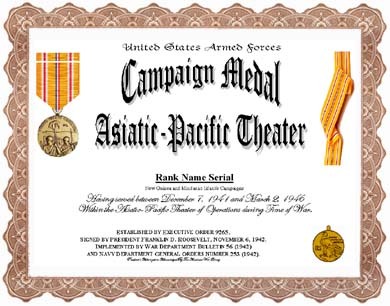 At the top of the medal, around the edge, are the words ASIATIC PACIFIC CAMPAIGN. The reverse of the medal shows an American eagle standing on a rock. On the left of the eagle are the raised inscribed dates 1941-1945 and on the right UNITED STATES OF AMERICA. The ribbon is yellow-orange with narrow center stripes of red, white and blue (United States). Near the edges are narrow white, red and white stripes (Japan). Participation is specific combat operations is denoted by three-sixteenth inch bronze stars. A three-sixteenth inch silver star is worn in lieu of five bronze stars. 1. Description: The bronze medal is 1-1/4 inches in width. On the obverse is a tropical landing scene with a battleship, aircraft carrier, submarine and an aircraft in the background with landing troops and palm trees in the foreground with the words "ASIATIC PACIFIC CAMPAIGN" above the scene. On the reverse, an American bald eagle close between the dates "1941 - 1945" and the words "UNITED STATES OF AMERICA". 2. Ribbon: The ribbon is 1 3/8 inches wide and consists of the following stripes: 3/16 inch yellow 67108; 1/16 inch white 67101; 1/16 inch scarlet 67111; 1/16 inch white; < inch yellow; center 1/8 triparted old glory blue 67178, white and scarlet; < inch yellow; 1/16 inch white; 1/16 inch scarlet; 1/16 inch white; and 3/16 inch yellow. (3) In active combat against the enemy and was awarded a combat decoration or furnished a recognition by the commanding general of a corps, higher unit, or independent force that he actually participated in combat. 5. Background: a. The Asiatic-Pacific Campaign Medal was established per Executive Order 9265, dated 6 November 1942, by President Franklin D. Roosevelt and announced in War Department Bulletin 56, 1942. The criteria was initially announced in Department of the Army (DA) Circular 1, dated 1 January 1943, so that the ribbon could be authorized prior to design of the medal. The criteria for the medal was announced in DA Circular 84, dated 25 March 1948, and subsequently published in Army Regulation 600-65, dated 22 September 1948. Source: The provisions of Executive Order 9265 of Nov. 6, 1942, appear at 7 FR 9106, 3 CFR, 1938-1943 Comp., p. 1224, unless otherwise noted. By virtue of the authority vested in me as President of the United States and as Commander in Chief of the Army and Navy of the United States, it is hereby ordered that the American, European-African-Middle Eastern, and Asiatic-Pacific campaign medals, including suitable appurtenances, be established, and that the said medals may be awarded, under such regulations as the Secretary of War and the Secretary of the Navy may severally prescribe, to members of the land and naval forces of the United States, including the Women's Reserve of the United States Naval Reserve, and to members of the Women's Army Auxiliary Corps who, during any period between December 7, 1941, inclusive, and a date six months subsequent to the termination of the present war, shall have served outside the continental limits of the United States in any of the respective areas as indicated by the names of the medals, such areas to be more precisely defined in the regulations hereby authorized. For the purposes of this order, the Territory of Alaska shall be considered as outside the continental limits of the United States. 1. The European-African-Middle Eastern Campaign Medal shall not be awarded for any service rendered subsequent to November 8, 1945. 2. The American Campaign Medal and the Asiatic-Pacific Campaign Medal shall not be awarded for any service rendered subsequent to March 2, 1946. 3. Effective October 12, 1945, members and former members of the land and naval forces of the United States, including the Women's Reserve of the United States Naval Reserve, and former members of the Women's Army Auxiliary Corps, who served in the continental United States for an aggregate period of one year between December 7, 1941, and March 2, 1946, inclusive, may be awarded the American Campaign Medal under such regulations as the Secretary of War and Secretary of the Navy may severally prescribe.